Now this is a diffusion index, with each country receiving equal weightings, and so it appears that 60% seems to be a viable threshold for the definition of “global recession” using the single-quarter definition (black) and 70% is probably the appropriate threshold for the 2-quarter definition (blue). Countries in “recession” for the 18 countries we have data for so far in 4Q are: Austria, Belgium*, Czech Republic*, France, Germany, Hungary*, Italy*, Japan*, Netherlands*, Portugal*, Spain*, Greece*, U.S and UK. 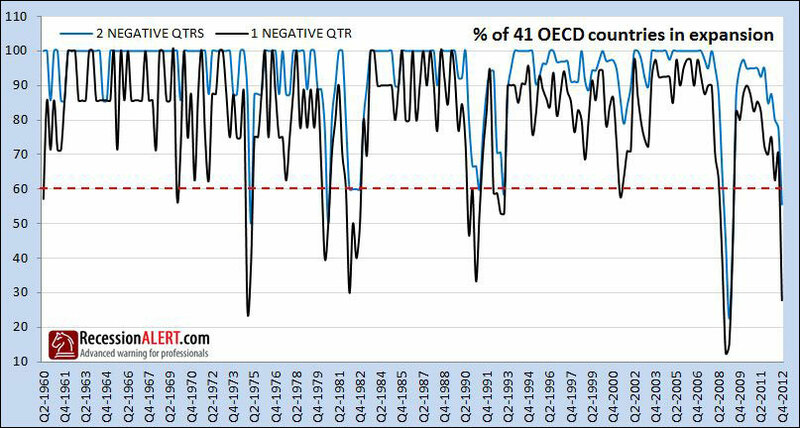 Countries with 2 consecutive negative q-on-q growths are highlighted with “*” next to their names. We should add that 4Q2012 GDP figures are preliminary releases, subject to revisions (we expect the US to revise upward) and we also only have data for 18 countries for the fourth quarter so far, and a heavy sprinkling of EU-based entities to boot that could be skewing the numbers to the downside. As the figures roll in during the course of the month/s we will update clients accordingly. It is clear the U.S is faring far better than most, but one has to question how long she can remain above water with the drag of her economic peers weighing upon her economy. Whilst most long leading indicators for the US are pointing strongly up, the co-incident U.S data is on the brink. We will be watching the two co-incident stalwarts - NBER Recession Model and the GDP/GDI Recession Models very closely indeed.